I always wanted to ride my bike to my home town of Guttenburg, 45 mile. It was a beautiful fall day. Two of my sisters, Sue and Carol joined the last 15 miles. We were able to share with others the joy of putting one more well in another country for those who lack clean and safe water. I want to thank everyone for your support. Donations are still accepted at this site. 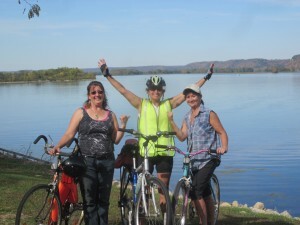 10/22/12 Mike&Eva Simon $50.00 Wish we could have biked with you - what a great cause! We love you! 10/01/12 Mark Stohl $45.00 Happy to help out a good cause. 08/09/12 Abby & Ryan Foley $20.00 Worthy wonderful cause, Linda - way to go! Maybe we can join you for the bike ride to Guttenburg!